It is evident that internet has become a necessity in today’s life. In fact many surveys and reports have revealed that people spend their most of the time on using internet whether at home or office. Today it is really hard to think life without web world. From mailing to online gaming, there is a need of a reliable and faster broadband service. But have you ever think of safety of your content and work over the web. If not, then it is important for you to understand some internet safety tips for safe and secure web access. •Password: It is always recommended to create a strong password for your important accounts, containing letters, special character and numbers. It is always hard to crack the strong passwords. At the same time, you should not create same password for multiple accounts because it becomes easy for the hackers to crack the password. Whether for personal account or financial account, it is good to generate a security question as well. •Privacy Setting: It is always necessary for you not to allow unauthorized access to your account. It has noticed that a lot of information related to your browsing is shared with third parties that allow hackers and marketers to track your activity over the web. To deal with the issue, many leading web portals and networking sites have now started providing privacy setting to prevent any fraud to your account. •Safe Browsing: It has also noticed that many unwanted links appear on your screen while browsing. Many a times some attractive pop-ups appear on the screen to tempt you and in order to get something excited, you access to those pop-ups that can lead nasty results. Therefore it is always important for you to resist yourself from clicking any unwanted links while browsing. Enjoy safe and secure web access and don’t be careless by any mean! •Network Security: Securing your network is as important as securing browsing. It is always necessary to install a network security with a password-encrypted router so that other can’t access to your network without your permission. It helps to prevent other and unwanted devices to connect to your network. •Stay Updated: It is also necessary for you to update your software and search engine to safe and secure web access. •Anti-Virus: Users should not forget to install good and effective anti-virus software in their system to prevent them from any form or virus. Updating the software is also quite necessary. •Shop Securely: It is necessary to make a practice of shopping safely over the web. Always try to explore those online shopping portals that are safe and secure for log-in. Check in URL, whether the portal is secure to access. Once you keep all these points in your mind, you always enjoy safe and secure internet access all the time. It is also good to choose a reliable broadband service provider for hassle free web access. Among various service providers, TriplePlay Broadband is one of the leading broadband service providers in Delhi NCR and many parts of North India which allows its users to enjoy a safe access to the web world and also time to time inform them about the safety tips for safer browsing. To ensure safe and secure web access, TriplePlay strives to adopt latest technologies and innovative methods so that you can always get connected to the world in flawless manner. 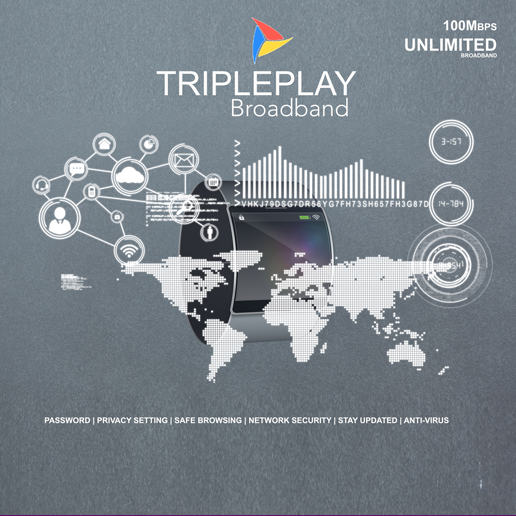 So get a connection of TriplePlay now!